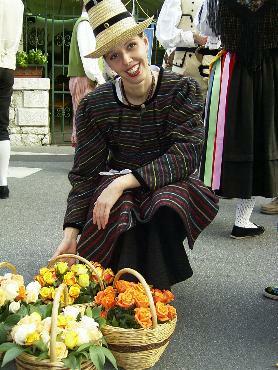 Hello all, today I will speak about the costumes of the Friuli people, also called the Furlan. This is the third of the Rhaetian / Romanic languages still spoken today. 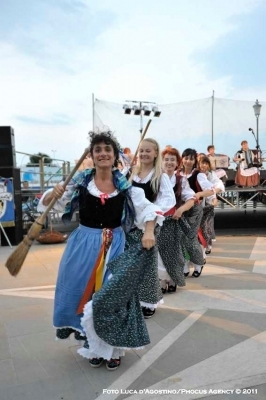 They occupy the northeastern corner of Italy, bordering German speaking areas to the north, Slovenian speaking areas to the east and Venetian speaking areas to the south. 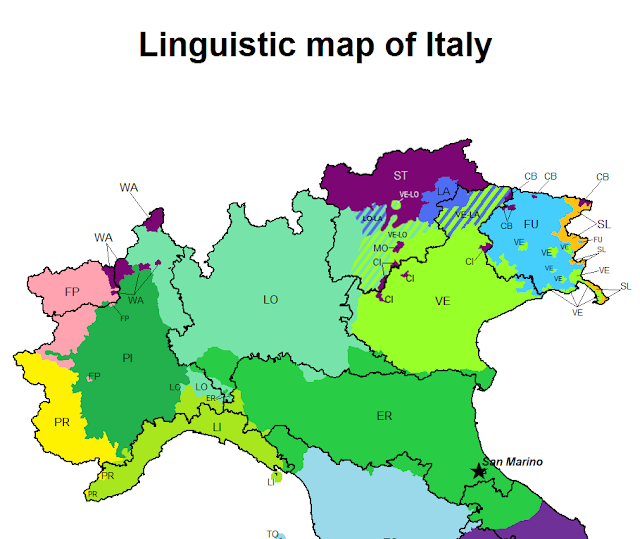 Here is a linguistic map of northern Italy. Friuli is shown in turquoise, Ladin in darker blue, German in dark purple, Slovene in orange, Italian dialects in various shades of green. The Friuli region is divided into three provinces, Pordenone, Udine and Gorizia. 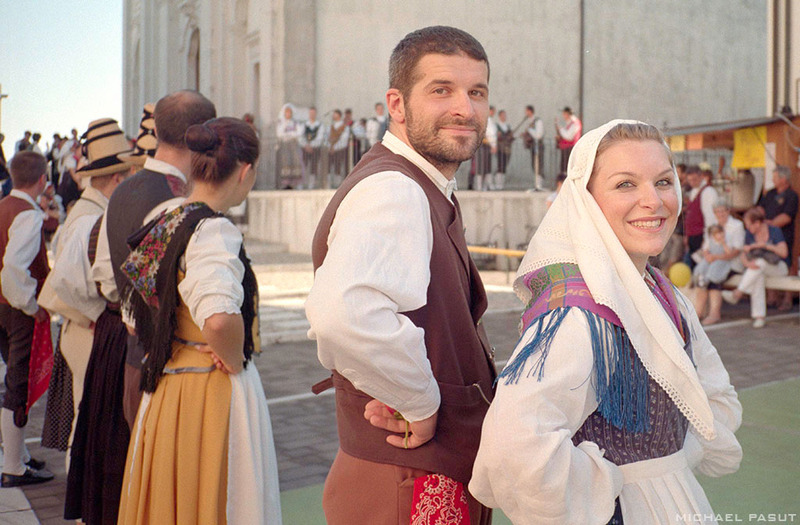 There are some Friuli speakers in the Trieste Region, which is very mixed ethnically. The best known folk costume in the Pordenone Province is that of Aviano, which is kept alive by the local Folklore Group. In fact, there are two costumes, as you can see from this photo. The one looks very alpine in character, with soft embroidered slippers and both men and women wearing small shoulder shawls. 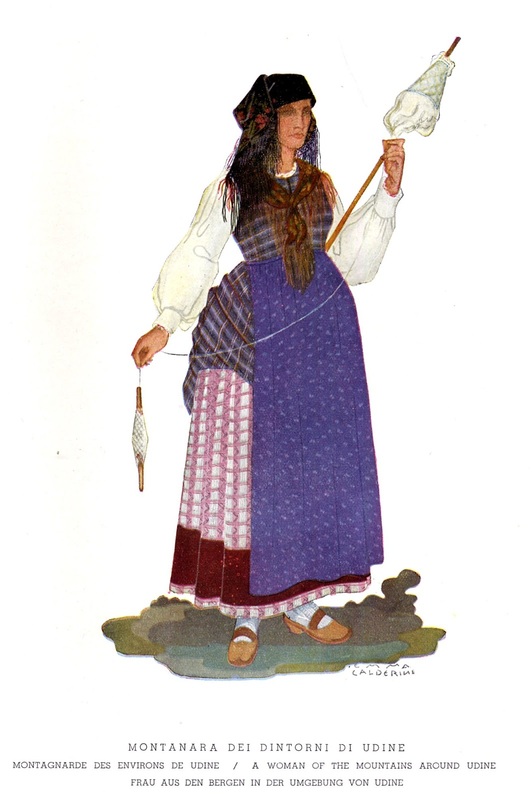 The other looks older, with some similarity to balkan costume, being based on homespun wool and having conical straw hats. 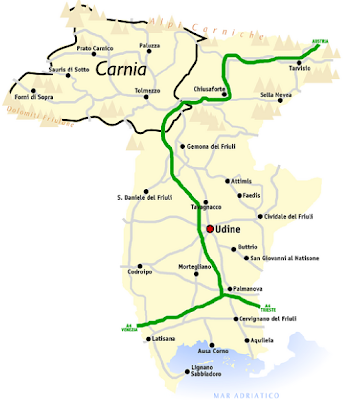 The northwestern part of the Province of Udine forms the region of Carnia. 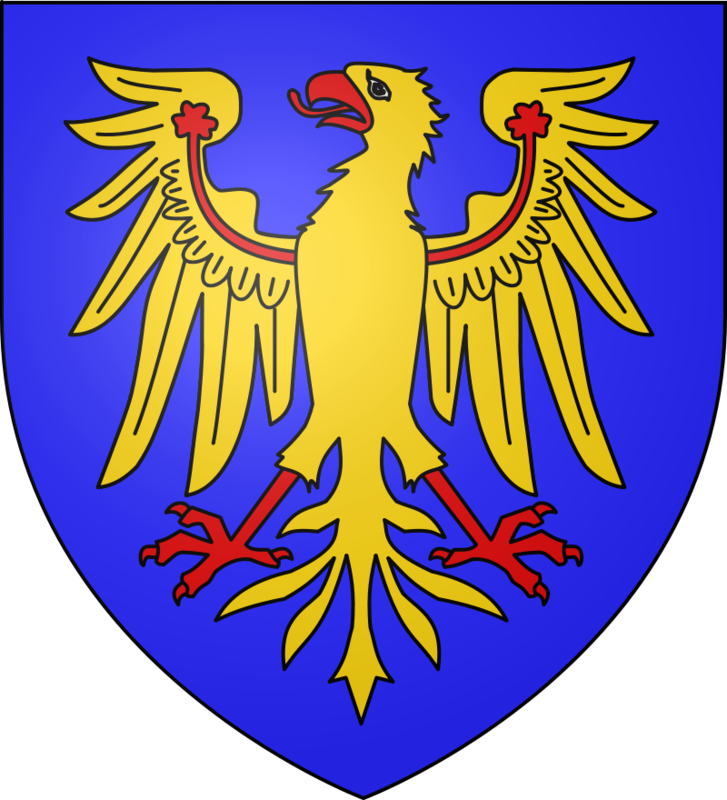 This borders on Austria to the north and the Province of Belluno to the west, and lies north of Aviano. 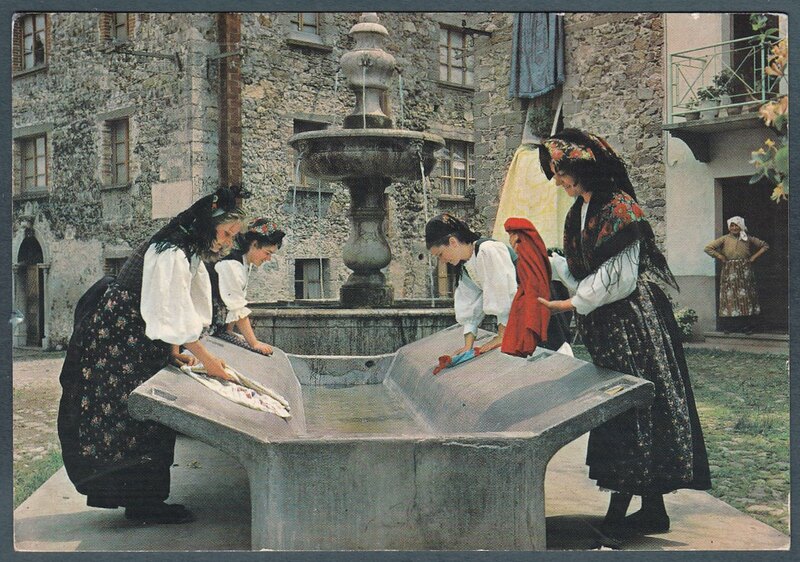 Notice that this woman is wrapping her headdress in the same manner as they do on the Croatian Island of Krk [Veglia], which is not that far away. One of the local Folkloric groups is Sot la Nape. 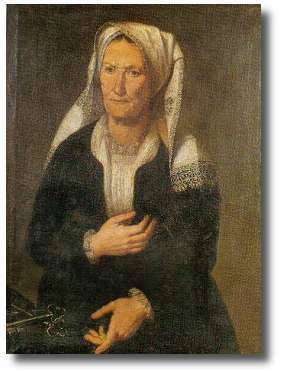 There are several groups from around Udine, Often the scarf here is folded or pinned back onto the head forming wings. 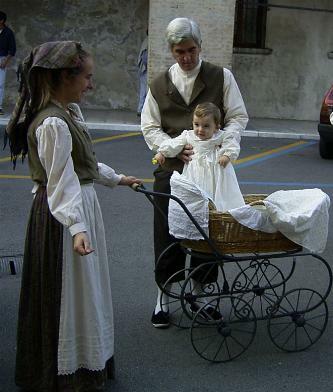 Here is the costume of Ciconnico. 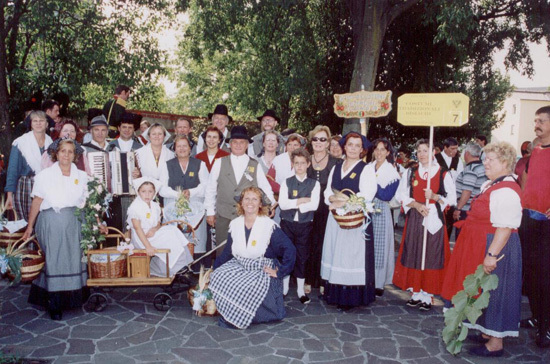 This is the Folklore Group Pasjan de Prato. 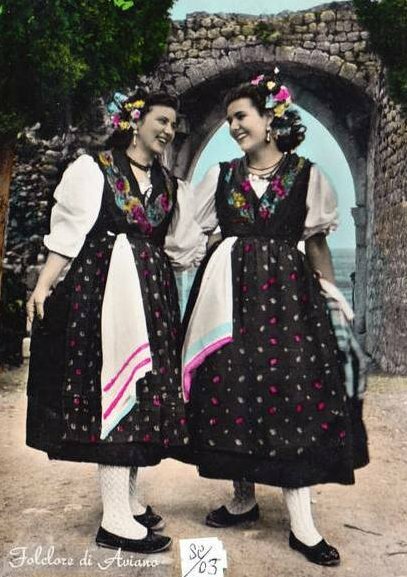 There is a significant Slovene Population in the eastern valleys of Udine province, Most famously in Val Resia, [Rezijanska Dolina]. The Slovene groups also participate in the local festivals. The dialect spoken in this valley is so distinctive that it is sometimes considered to be a separate language of its own. 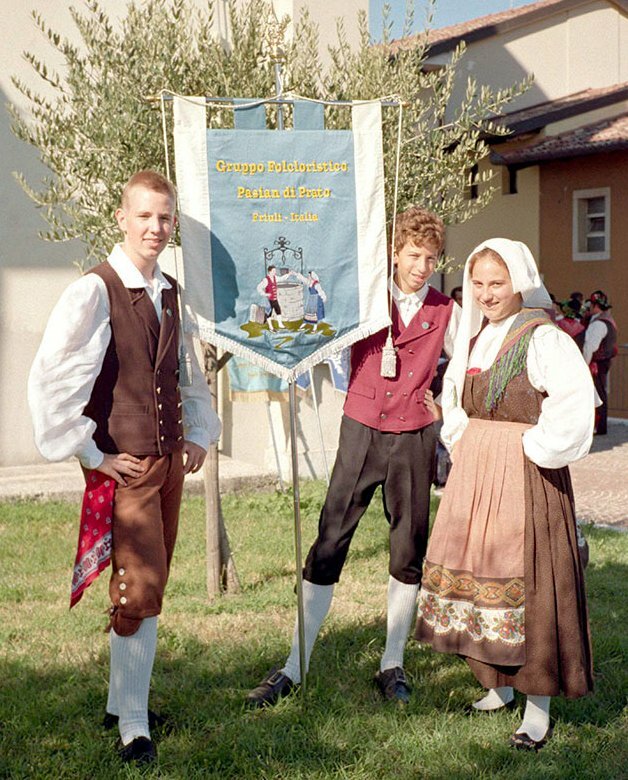 In the Province of Gorizia [Gorica] there are also many Slovenes. 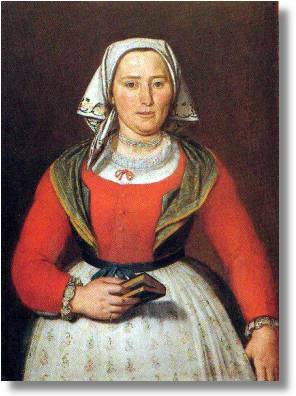 The costume here shows influence from Venice and the coastal regions. 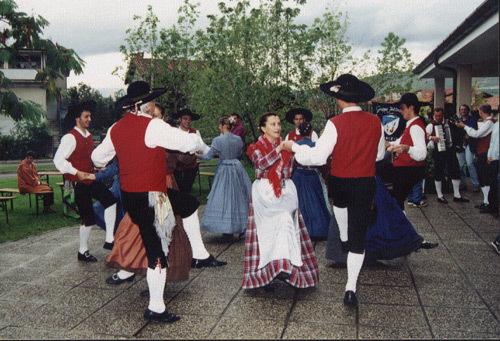 One of the local groups is Lucinico. They do presentations in the everyday work costume as well as the dress up version. 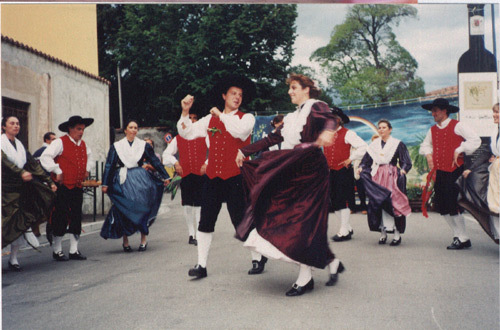 Another group in this region is Santa Gorizia. 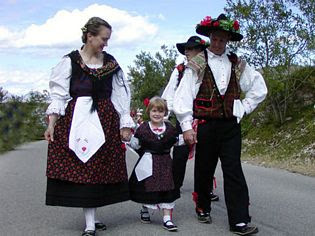 They are well known for their elegant costumes and dancing. 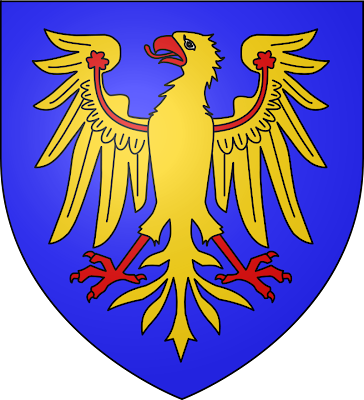 On the borders of Trieste is the town of Monfalcone. Thank you for reading. 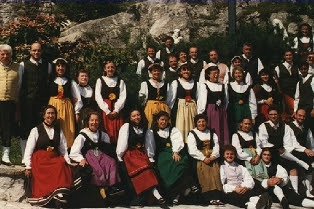 I hope you have enjoyed this overview of Furlan Costumes. I feel like I need more information to do a more systematic job, but this is the material which I currently have. 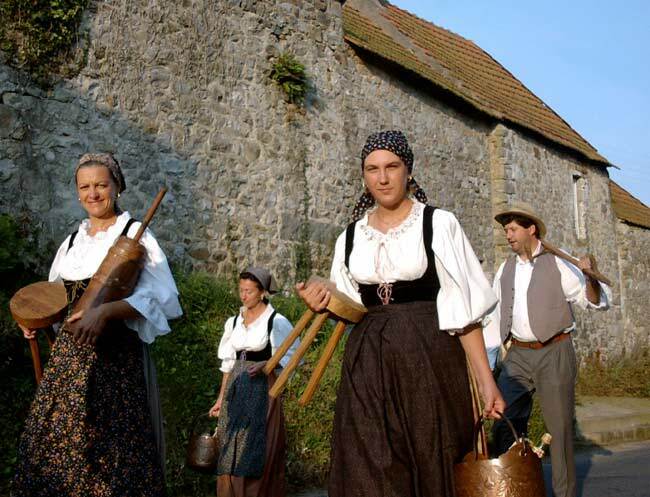 You can see more images and local groups on this website which shows pictures taken at a Friuli Folklore Festival. 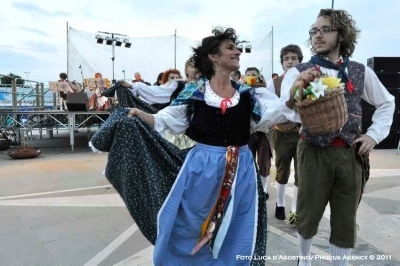 Here are a couple of videos of Friuli groups dancing. 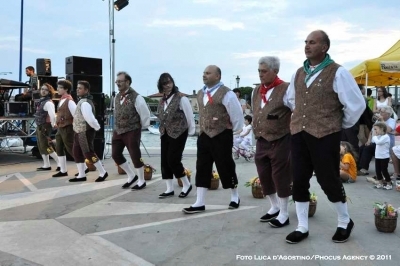 Here is the group Santa Gorizia doing La Vinca. 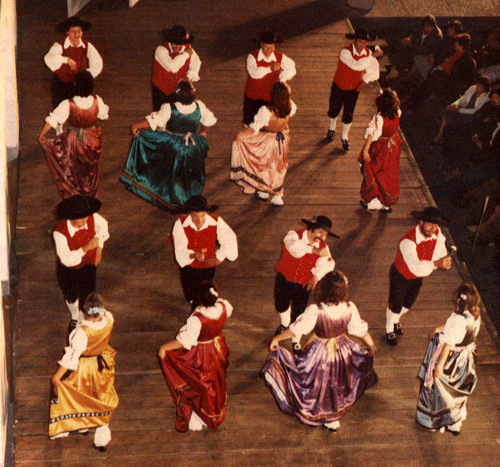 The same group dancing Mazurka and another dance. 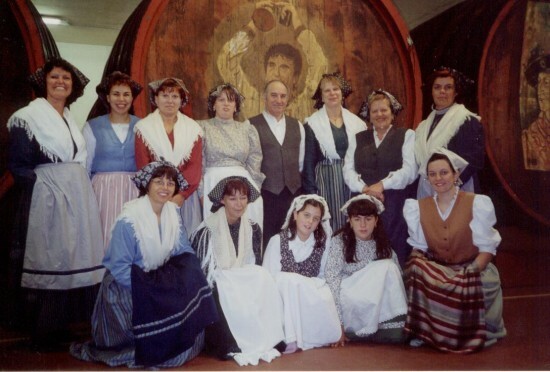 Most of this material i found on the web, especially on the websites of the various groups which keep the Furlan traditions alive. Really interesting and unique blog! 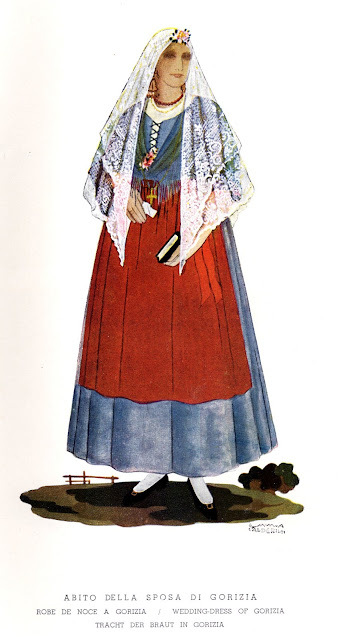 The outfits you showcase here are really beautiful- I love the historical context you include in each post too, really educational! I wonder if you would like to share this on Glipho? We are a new social blogging site, and our aim is to create a strong community of creative writers- you would be perfect there! You can even import all your old posts over, it's pretty easy- if you fancy, have a quick peek over at http://glipho.com and see what you think! Feel free to ask me any questions too!